I’ve discovered I seem to have a thing for odd flashlights that make things easier. Perhaps it’s just that I really hate having to work on anything in the dark and I know I’m not the only one. 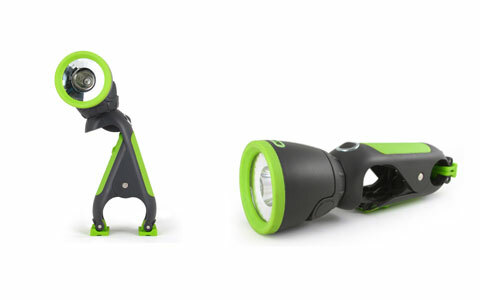 Well this ClampLight has the ability to be used just like your everyday flashlight, which is a must. Then to top things off, it allows for you to have hands-free lighting when you really need it. Be it to work on something or just using it while you’re out camping so you can read a book at night. Despite that the commercial likes to show off the ClampLight as if it’s some friendly robot, it’s not quite that awesome. This ClampLight does indeed clamp onto things, just like the name indicates. Then the head of the flashlight can swivel around to get you the ideal angle you need. If you don’t need it to clamp to anything, you can either hold it like normal or you can do a quick adjustment and have it sit up on a tabletop. The bulbs in this are said to run forever and it runs on 3 AAA batteries. You can purchase it for $29.99 from BlackFire.